Thanks to a changelog posted by Verizon, we now have even more details for the Android 4.3 update that is scheduled to hit the Galaxy S4 over the coming days. We first reported the update this morning, however, Samsung’s list of changes didn’t quite meet Big Red’s usually detailed standards. In the images included in this post, we not only get a deeper look at build VRUEMJ7, but also a Galaxy Gear tutorial for those new to the smartwatch, since the GS4 will support it going forward, and new additions and tweaks you’ll be glad to see. 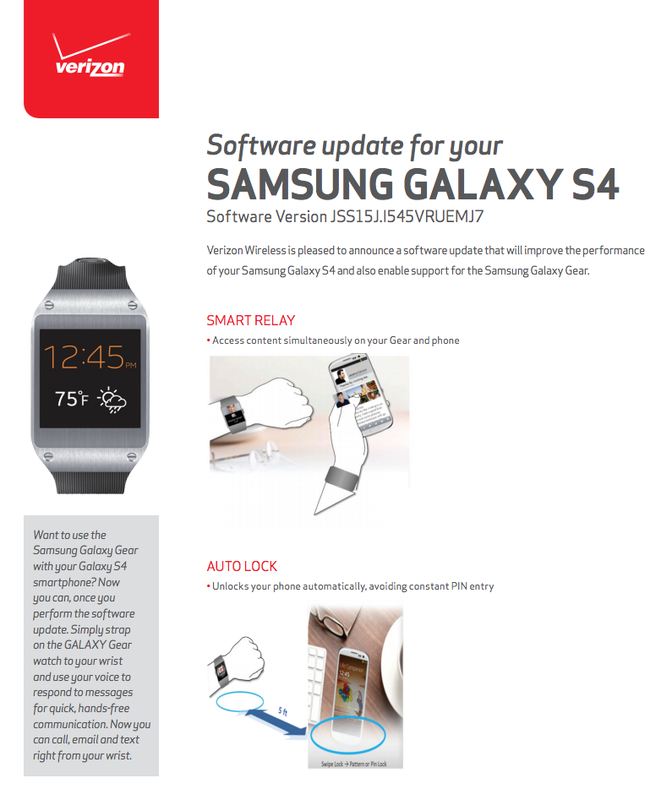 The image above is just a quick look at the Galaxy Gear and how it will work with the Galaxy S4, but you’ll get a better feel for it by looking at our full review. 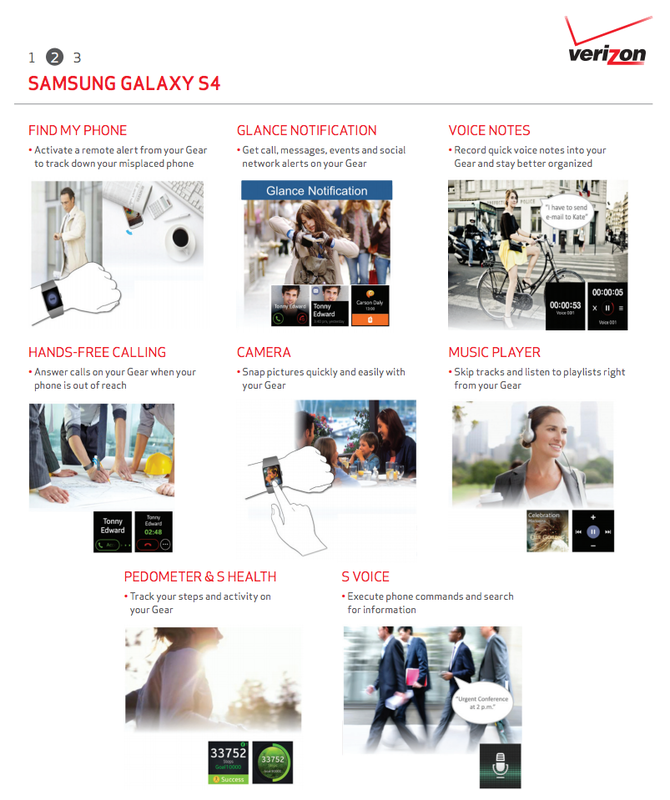 You should get full functionality when paired to the GS4, just like you would see on the Note 3. Should we find changes between the two, we’ll be sure to let you know. 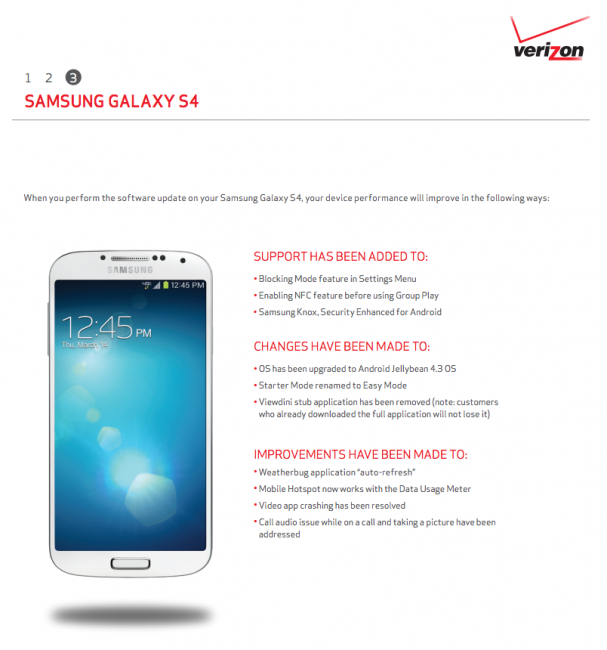 In terms of other goodies, it looks like Verizon caved in on Blocking Mode and has now enabled it on the Galaxy S4. They also brought in Samsung KNOX, updated the phone to Android 4.3, switched Starter Mode back to Easy Mode, removed Viewdini, and fixed some bugs. The update should also enable band 4 LTE, though this list doesn’t say it. The update has yet to begin rolling out. It looks like the update is a hefty 329.5MB in size.